Protect your pet's eyes with Optimmune Ophthalmic Ointment. One of the most common eye ailments facing dogs is dry eye (scientifically known as Keratoconjunctivitis Sicca or KCS). Dogs suffering from KCS experience dry, red, and itchy eyes due to their inability to produce enough tears to keep their eyes moist. 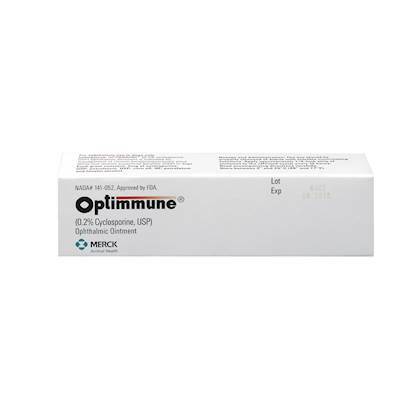 The active ingredient in Optimmune Ophthalmic Ointment modifies your dog's immune response to correct and reduce symptoms of KCS, as well as to treat Chronic Superficial Keratosis, an inflammation of the cornea. Optimmune Ophthalmic Ointment is FDA-approved and treats dry eye' without causing system toxicity. It is also preservative-free and thus has little chance of causing secondary or chemical infections in your pet. Do not use Optimmune Ophthalmic Ointment where there is a preexisting viral/fungal ocular infection. This ointment can temporarily blur your dog's vision so be sure to keep your pet still for several minutes after the application. Before use, remove any debris from your dog’s eye, then apply a ¼ inch strip of ointment to the cornea near the lower eyelid. This treatment is for chronic eye problems, and will most likely need to be administered on a regular basis.